I was kind of suggesting that the "no fewer than 10" rule is ridiculous. Use 50 words if that's what it takes. As I discussed in my TTT talk, I think you can use bullets/numbers, bolding, indents, color, etc. to make a good deal of text easily scannable, and easy to absorb. A supporting image helps. Great information here! In response to the question, "What’s your view on how much information should be placed on a single PowerPoint slide?" Atkinson replies, "Actually the question should really be: How much information should be presented, both verbally and visually, given the time constraints of a presentation?" the point is to be engaging with your topic and your audience. 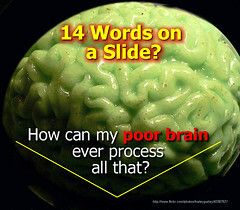 not to use your ppt slides as your notes. do use them to back up what you're saying, or for visual interest that (might) relate to what you're saying. if you want your preso to be useful online, then make your notes public too. it's hand to ask yourself one question: would you want to sit through your preso?